By early 2017 only one Postbus route survived in Scotland, linking Lairg in Sutherland with Tongue and Talmine on the far north coast. This sadly means that the page that follows is largely of historical interest only, though for the moment we have left it as it as written when Postbuses were a viable way to travel in some parts of Scotland. Parts of the Highlands and Islands of Scotland are extremely remote. As our Travelling Around Scotland page suggests, Scotland does rather better than you might expect in terms of both train and bus services. But sooner or later there will come a point when you've left the railway lines far behind and the scattered communities along the road you want to travel simply won't support a bus service. This is no problem if you have your own means of transport, but what if you don't? 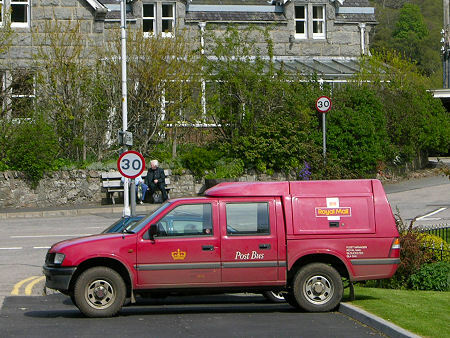 The mail service in even the remotest areas of Scotland is very good, and keeping it that way involves a lot of postmen and postwomen covering a lot of miles making deliveries to scattered communities and emptying postboxes. Back in 1967, in the aftermath of major cuts of rural rail services across many parts of the UK, someone in the Royal Mail had a really excellent idea. Why not make use of all these post vehicles criss-crossing remote rural areas to provide a partial solution to the public transport problem, and cover some of the costs involved in mail collection and delivery at the same time? Postbuses are not unique to the UK, they can also be found in Austria, Germany and Switzerland. When we first wrote this page we went on to say: "Those in the UK serve around 200 different routes, usually twice a day from Monday to Friday, and in some cases once on on a Saturday morning. In Scotland 35 routes are served, many on islands or in the remotest areas of Highlands: exactly the places where you are most likely to find yourself without other travel options." Sadly, by 2012 the total number of Postbus Services in the UK had been reduced to just 11, though of these eight were in Scotland: one on Luing, one on Islay, one in the far north of the Highlands, and five in the Western Isles. This remained the pattern as of early 2015. Anyone wanting to use a Postbus can flag it down anywhere on its route, where it can sensibly and safely stop. Tell the driver where on the route you want to go you'll be told the appropriate fare, which averages between £2 and £5 for a single journey. Concessions can apply for under 16s and for senior citizens. Remember that the main job of the vehicle is to deliver or pick up mail, so this is may not be fastest way to get from A to B, but it certainly beats walking, and you can guarantee you'll learn far more abut the area you are passing through than you would by any other means.